Extrufood not only manufactures a range of production extruders, but also produces a lab sized cooking and forming extruder. These extruders are ideal for testing new recipes for the development of new products. Both Extrufood lab extruders are scaled-down versions of our production extruders. Products and recipes extruded on either will be indistinguishable. 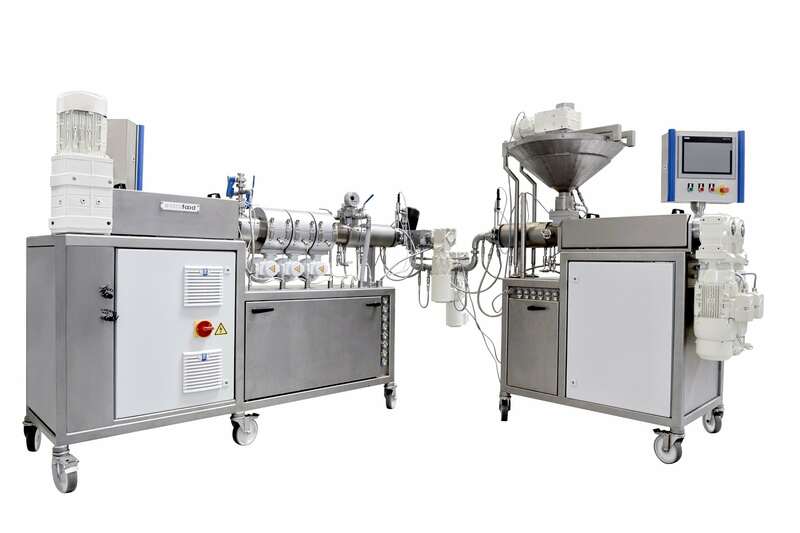 Using an Extrufood lab extruder as part of your R&D department will give you all the flexibility and possibilities needed to improve both existing as well as new recipes and products, without loss of any production capacity on your production lines. The low capacity of up to 15 kg/hr for the lab cooking extruder and up to 50 kg/hr for the lab forming extruder, allows you to work with small batches and saves large amounts of slurry for testing. Due to the relatively low volume of material, this method enables you to perform many tests in one run. Lastly, we can also provide you with a lab extruder, in order for you to develop and test new products. Extrugroup is well-known for their unique, continuous production lines and tailor-made components such as cooking-, mixing- and forming extruders, Diemixes®, Dieswitch®, rotary, co-extrusion and fixed dies, cooling tunnels, sugar sanders and cutters which are used by confectionery, pet food, and plastics market leaders all over the world.